Geared towards children ten and under, this non-haunted adventure takes you on a 15- to 20-minute hayride to the Witches’ House. Once there, kids and their parents will enjoy a story, listen to jokes, and get a treat to take home. After the hayride, stay for apple cider and s’mores around the campfire. Celebrate fall with larger than life figures and scarecrows, piles of pumpkins, hayrides, pick-your-own produce, corn and hay bale mazes, and much more. Visit the Children’s Corner for some hands-on pumpkin fun, and capture a festive fall photo with the largest pumpkin on display, weighing in at more than 700 pounds! Find this yearly favorite right near the restaurant at Longwood—it includes almost 400 feet of track, and beautiful models of favorite Longwood buildings constructed from natural materials. It opens Thursday and runs through the end of the year. If you’re at the mall (or need an excuse to go), stop by Lord and Taylor Court to see a display of unparalleled, curator-approved replicas of nine Van Gogh masterpieces– it is even possible to feel Van Gogh’s famous brushstrokes! This pop-up is the first stop on the Van Gogh Museum’s tour, and will be there until October 14. Normally just open on weekends, the corn maze will be open on Monday for school’s-out fun. Open to the first 15 kids (ages 2-5), this parent and me STEAM workshop will let kids experiment, learn, play, or just get messy! Meet firefighters from the Brookline Fire Company and learn about fire safety. The firefighters will show children their equipment, talk about fire safety, and have fun giveaways. First, Jennifer Nicole Campbell will host a 30-minute segment where she will introduce the children to the instruments, conducting, and what to expect. Then, the symphony will have its rehearsal. Attendance is free, but registration is required as space is limited: 610-623-3607. It’s Fire Prevention Week, so kick it off with demonstrations of firefighting and rescue skills, educational displays, and more. Young guests can enjoy nature-based stories in Lookout Loft Treehouse amid the beauty of the surrounding forest. Storytelling, songs, and puppets encourage children to discover the joys of nature, language, and literature. Story Time is designed for children ages 3–5. In case of inclement weather, meet in the Peirce-du Pont House. Radnor Memorial librarians will host a storytime for kids ages 3-5, along with crafts, STEM activities, and music. Come for a special fall-themed Sign Language storytime. No reservation is required, and admission is included in the normal Play-By-Day rate. Kids ages 4-6 and their favorite adult will learn about gardening, and even try some of their own. Pre-registration is required. Come in your favorite PJs for stories, songs, and a craft followed by a book trek around the library finding all the books you want to take home. This week, kids will learn to make healthy no-bake granola bars and bliss balls. Thematic content and cooking tasks will be best suited to kids aged 3-6, but all ages are welcome. Pre-registration required online. Celebrate National Teen Read Week’s “It’s Written in the Stars” theme with an astrology program, and get the basics on the twelve signs of the zodiac. For grades 6-12. Children will explore the natural world around them, play outside, and discover the many critters that make nature so interesting. This week, kids will go on a constellation exploration and learn about the planets in our solar system. Pre-register online. 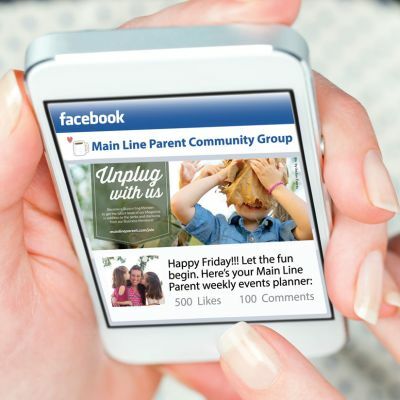 Call your babysitter and join us to celebrate the 20th Issue of Main Line Parent magazine! Meet the Family Focus Media team and the organizations we partnered with to make this issue our best yet! The party will feature hors d’oeuvres, dessert and a cash bar. Visit the Children’s Garden and enjoy a nature-themed read aloud. After the stories, borrow a Jenkins Explorer Vest and binder of materials to enjoy as you walk along the garden paths. Event is free, but online registration is required. Rain or shine. Appropriate for kids age 3-8, accompanied by an adult. Young children and their grownups hear a story, interact with art in the museum and make their own creative works. This week, hear Last Stop on Market Street. Come in for storytime and a themed art project to go along with the story. Pre-register online. Free yoga for kids ages 4-8. Register by phone or in person. Bring your own mat or towel. Arrive at 5:30 pm. Teams will be formed, dodgeball will be played, swag will be awarded. Access to Main Court, Foam Zone, and Sky Slam is available in between games. Watch Longwood’s spectacular fountain display, set to the music of Motown. Pre-register for tickets in advance. cBOP is turning one! Celebrate its birthday with treats, kids’ activities, a visit from Gladwyne Montessori, and more surprises. Join Plymouth Township Parks and Recreation and Maple Acres Farm for a hayride and pumpkin pick. Purchasing a pumpkin is optional. Come for a weekly music circle for little ones, then stay and play! Pengfei Wang, a professional musician and composer specializing in crossover music genres, will lead a series of interactive music sessions in Chinese for preschool-aged children. This sneak preview of Boo at the Zoo events is specially geared for guests with special needs, and their families and caregivers. This is a great opportunity to experience and enjoy Boo at the Zoo in a more relaxed setting, perfect for those with sensory sensitivity. Kids can walk the zoo and participate in treat stations, animal meet-and-greets, and more. Celebrate Teen Read Week and explore constellations, myths and create a 3D printed constellation of your own. For grades 6 and up. Register here. Lulu’s is open until 7:30 pm for more fun, BYOB, and pizza starting at 4 pm. Parents can relax with some adult beverages while kids tire themselves out before bedtime. Come in costume and enjoy special extra Friday night hours with everyone’s favorite furry friends dressed up in costume, a parade, trick-or-treating, and more. This special event features a pumpkin decorating session for 30 minutes which follows an hour in two giant bounce stadiums. Admission includes everything needed; each child will receive a small pumpkin and all the decoration needed to personalize their pumpkin to bring home. Pre-register online. Wear your best witch or wizard costume and discover the science behind potions, meet fantastic beasts, test your supernatural skills at a variety of magic-themed games, activities, crafts, and more. Pre-registration. All you favorite Dr. Seuss characters come together in one place for this fun and flashy musical geared for kids of all ages. Gather ‘round the fire and listen to some tales. Feast on fall favorite treats that are fun for the whole family. Pre-register by October 8. Luxey Little Ones is a new baby boutique in West Chester and will be closed to the public for a private shopping event for the Main Line Parent Community. Enjoy discounts, treats, giveaways, and more. The first 25 shoppers will receive swag bags! Get all our weekend picks in the High Five, here!